Do you know your calling? Most people realize there's a God-given purpose to their lives, but aren't sure how to find it. Tringale breaks the process down into manageable steps---showing you how to position yourself to cooperate with the powers working for you and handle the forces that are against you---unlocking blessings beyond measure. 160 pages, softcover from Whitaker. Most people know or suspect that there is a purpose for their life, but they do not know how to collaborate with it. Calling: Understanding Your Purpose, Place & Position breaks that process down into steps. It details the forces at work on the path of your destinyboth those that are working for you and the ones working against you, so you can position yourself to handle both. Jen Tringale has written this book based on her own and others experiences of walking the path of destiny. She speaks to the heart of every believer who desires to see Gods plan for their life become a reality and wants the tools to achieve it. The vast changes in our worldwith ever expanding technologies, social shifts, and economic twists and turnsdemand that a new breed of pioneers emerge, ready to discover what God has in store for them. Her reach includes a robust international speaking schedule; her books, Your Defining Moment, When Time and Destiny Meet, and Calling, Understanding Your Purpose, Place and Position; and a podcast that opened in iTunes Top 40 charts with an audience of more than thirty thousand listeners in over fifty nations. Her international influence includes meetings with heads of state, cabinet members, and U.S. Embassy and State Department representatives. In 2016, she hosted a history-making, nationwide womens conference in the nation of Grenada. It was the first of its kind, with thousands in attendance, including dignitaries and prominent leaders. After over twenty years of ministry, Jen is positioned as a leading voice in the current generation who communicates with clarity, boldness, and passion on divine destiny and bringing Jesus Christ into culture. Her initiatives to equip and empower extend beyond the pulpit and pew into every arena of culture for influential shift. She has appeared on television networks such as TBN, TCT, and the Believers Voice of Victory Network, and has been featured in the Word of Faith Magazine. If youve read Calling and have additional questions or thoughts, she would love to hear from you. You can also email her at info@jentringale.com; listen to the Jen Tringale Podcast on SoundCloud, iTunes, and Google Play; and visit the website at jentringale.com. The question "What is my calling?" burns in the heart of every generation. Jen Tringale has addressed this question with powerful answers in her book. Whether you are a young person discovering your passion at the start of your journey, or older, and the changing season has you asking God, "Whats next? "this book is for you!" Polls indicate the hunger to find ones purpose is the strongest desire motivating most of us. After many detours and much frustration, I found mineand in so doing, I found myself. With this wonderful book by Jen Tringale, your journey to self-identity and fulfillment can avoid many needless delays and pitfalls. I wish Id have had it early in my journey! Most people know that there is a purpose for their life. The problem is that they do not know how to align their life with that purpose. Jen Tringale will help you create your own path, leading you to the place of discovering your personal purpose and fulfilling your destiny. Jen Tringales message empowers believers to walk in the fullness of Gods calling and see the glory of God impact this generation. Many aspects of growing into your calling are covered in this book in a practical, but deeply spiritual, way. It is provoking, challenging, and inspiring, all the while pointing us to Jesus. Wow! Jen Tringale has written an incredible book that will put you on the right path to fulfilling your calling! Youll find faith-filled encouragement to discover the call of God on your life. This is a must-read for anyone who desires to fulfill their destiny and the dream God has placed in their heart. A well-thought-out, easy-to-understand work that allows you to embark on the journey of answering the questions, "Why am I here?" and "What am I to do?" Jen doesnt just lead you on the path; she also equips you with the tools to find the answer. Jen Tringale delivers powerful inspiration and profound insights to guide you into aligning your pursuits according to the trajectory of your destiny. Prepare to find your place, get into position, and take up your calling to walk out a destiny thats brighter and more beautiful than anything you have ever dared to imagine! The riches penned on these pages could well be the greatest game-changer yet for the person with an open heart and a willingness to leave the fear-dependent safe harbor of comfortable predictability. Jen Tringale makes it crystal clear: you were designed to push outwardto explore, discover, lead and enrich the world around you. Unfurl your sails, and let them fill with the divine winds of your Calling! 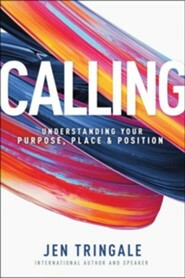 I'm the author/artist and I want to review Calling: Understanding Your Purpose, Place & Position.